October 20, 1890 is one of several possible birth dates for famed jazz pianist and composer Ferd. “Jelly Roll” Morton, the others being September 20, 1885, September 20, 1889, and September 13, 1884. For the sake of this post, happy 125th birthday, Jelly Roll. For the occasion, I present one of his finest recordings. One of the most interesting and storied characters in jazz, Jelly Roll Morton, born Ferdinand LaMothe, later Mouton after his mother remarried, started out playing piano in the Storyville “sporting houses” of his home town of New Orleans before taking off to tour around the United States, working in minstrel shows and vaudeville, as well as reportedly a gambler, pool shark and pimp. He first recorded in 1923 for Paramount, and recorded with a number of different groups until he was signed to Victor in 1926, with whom he remained until he was abruptly dropped in 1930. The Depression years proved difficult for Morton, who was robbed of royalties by his publisher, Walter Melrose. He was recorded again for the Library of Congress in 1938 and began recording again around then. Blaming his declining health on a voodoo spell, Jelly Roll Morton died in Los Angeles, California in 1941. Victor 20415 was recorded December 16 and 11, 1926 at the Webster Hotel in Chicago, Illinois. The Jelly Roll side features George Mitchell on cornet, Kid Ory on trombone, Omer Simeon on clarinet, Jelly Roll Morton on piano and also singing the vocal, Johnny St. Cyr on banjo, John Lindsay on string bass, and Andrew Hilaire on drums. 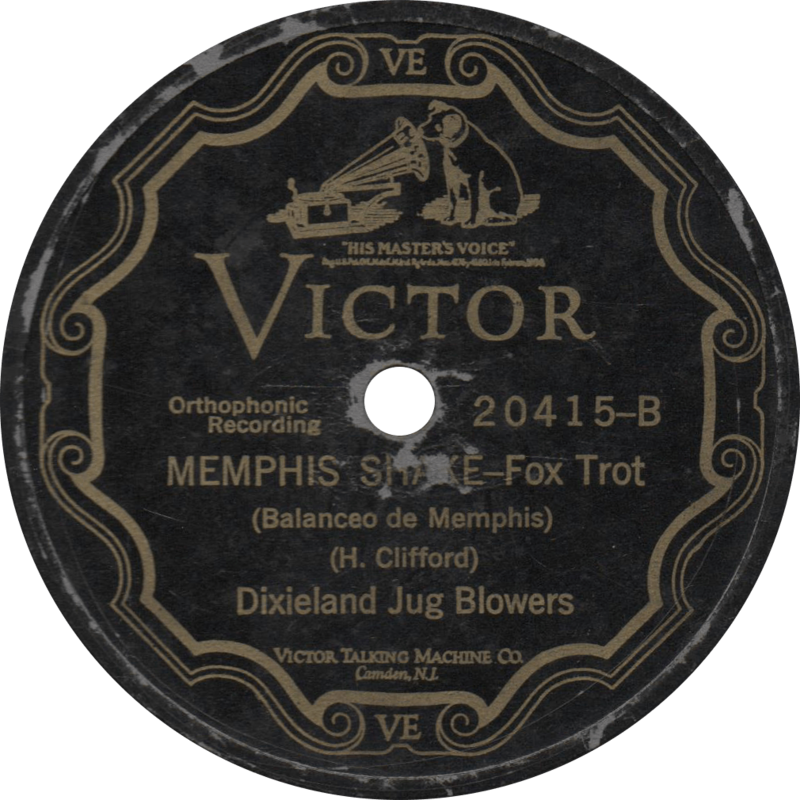 The Dixieland Jug Blowers side features Johnny Dodds on clarinet, Lockwood Lewis on alto sax, Freddie Smith on banjo, Cal Smith on tenor banjo, Curtis Hayes on guitjo, and Henry Clifford and Earl McDonald on jugs. 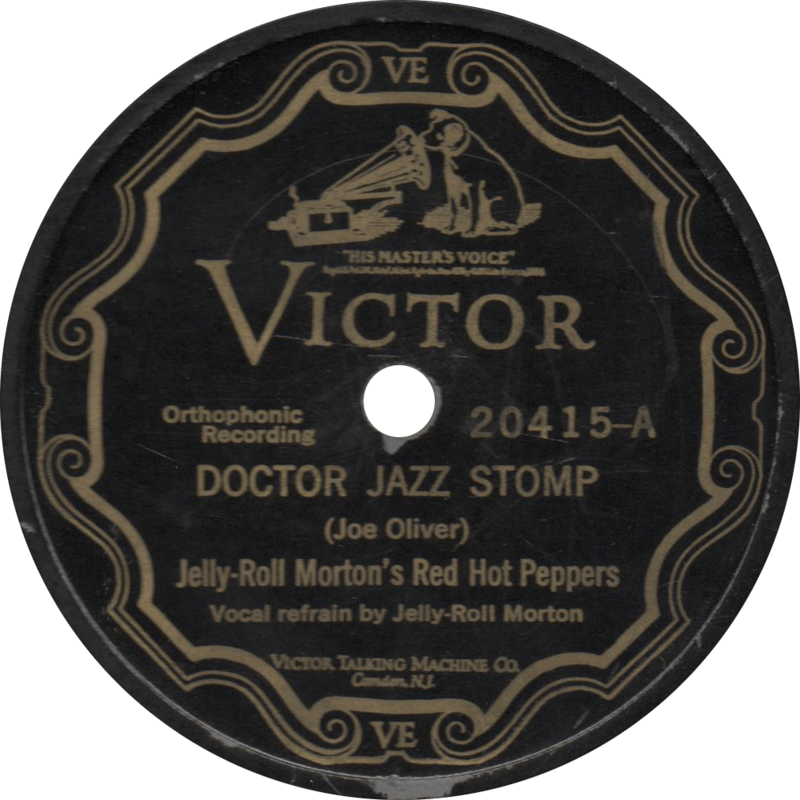 First up, Jelly Roll’s Red Hot Peppers play one of their all-time greatest sides, King Oliver’s “Doctor Jazz Stomp” (and boy does it stomp), recorded on the December 16 date. Doctor Jazz, recorded December 16, 1926 by Jelly-Roll Morton’s Red Hot Peppers. On the flip side, the Dixieland Jug Blowers with Johnny Dodds on clarinet play “Memphis Shake”, recorded on the December 11 date. Memphis Shake, recorded December 11, 1926 by the Dixieland Jug Blowers. Updated with improved audio on June 6, 2017. This entry was posted in Records and tagged 1920s, 1926, Andrew Hilaire, Cal Smith, Chicago, Curtis Hayes, Earl McDonald, Freddie Smith, George Mitchell, Henry Clifford, Jazz, Jelly Roll Morton, John Lindsay, Johnny Dodds, Johnny St. Cyr, Jug Band, Kid Ory, King Oliver, Lockwood Lewis, Omer Simeon, Victor by R. Connor Montgomery. Bookmark the permalink.